"Can anyone direct me to the Smithsonian? I'm looking for an old fossil..."
In the film, Black Widow (Scarlett Johansson) says the above in reference to Captain America, shortly after Steve Rogers (Chris Evans) has met Sam Wilson (Anthony Mackie) aka The Falcon, for the first time. 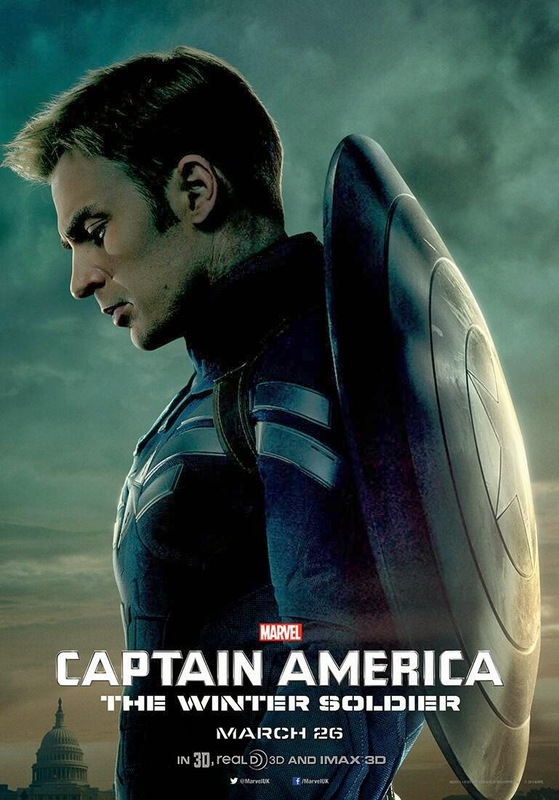 While it may also mirror what many feel when they think of Cap, Captain America: The Winter Soldier perfectly presents the case for why one man holding dear to a dream much of the world has left behind is still relevant, and in doing so creates the best Marvel Studios film since the Disney merger, if not the best Marvel Studios film yet. Stripping back the endless CGI and scale installed by the likes of Iron Man 3, this epic's move to focus on pacing and story is its brilliance in a red and white striped nutshell. In adapting writer Ed Brubaker's comic book epic about the mystifying return of The Winter Soldier, Cap's mind-washed WWII ally Bucky Barnes, this film doesn't attempt to squish that bazillion issue affair into one film, but rather be the saga's opening salvo. With a confidence that inspires like that of its titular hero, twists and tension build, while still allowing for those moments that make fans squeal (like Dr Strange named as a HYDRA target). One-upping The Avengers, all six heroes in this film (including Agent 13 and Maria Hill) get their moments in the sun, as they rise to stop a covert threat from cracking S.H.I.E.L.D. from within and turning it against the world. An espionage film over a 'comic book' one, The Winter Soldier finally allows us to see some characters properly. Black Widow in particular feels like she debuts in this film. Having been around since Iron Man 2, Scarlett's role outgrows the 'hot redhead in leather with action figure kick' role to become Natasha Romanoff, reformed spy who realises she's swapped the lies of the KGB for the lies of S.H.I.E.L.D. and now needs to define her own truth. With definition left to Natasha and Steve, who in the sudden absence of Nick Fury (Samuel L Jackson) are puzzled by the actions of their employer, re-definition is on the side of their rogues gallery. In fact the film is so excited to show you what it has done with them, the title is absent from the start of the film, in order to throw Cap into battle with Batroc. The somewhat laughable classic Cap foe is brilliantly executed by UFC welterweight champion Georges St-Pierre and I swear, I will never call 'The Leaper' an 'easy beat' again. And it doesn't stop there. Arnim Zola looks like a computerised menace of the wartime era should and Baron Wolfgang von Strucker looks an even nastier HYDRA maestro than The Red Skull ever did. If Crossbones was visually inline with Brubaker's run, all their bases would have been loaded across the board. Back on the heroes side of the fence, how Steve and Sam's mutual respect plays off each other nails the best comic movie bromance yet. In fact I wouldn't be surprised if Cap 3 is simply titled Captain America and The Falcon: Brothers In Arms, or something to that effect. Anthony nails the size, character and heart of the humanitarian hero, as Evans delivers his best outing as Cap beside him. With scenes like these, a clever flashback of first movie facts that doesn't feel like one and a heartbreaking scene with Peggy Carter, Chris has not just grabbed a hold of the mentality of the character, but now wears the role like a tailor-made glove. If any stitch errors in the sewing of this film, it is that a nod to Cap co-creator Jack Kirby needs to be louder than naming a hijacked ship after The King's creation of the sunken continent of Lemuria. Granted 'hijacked' may be in reference to red-tape nonsense around the Kirby legacy and Marvel, but it really boils down to a matter of respect. Cap is one of Jack's defining works and proper respect has yet to be delivered in either instalment. Neither for that matter, has it been to fellow co-creator Joe Simon. Stan Lee on the other hand gets a cameo and as you'd expect, so to deservingly does Ed Brubaker, in the in-film 'birth' of his co-creation, The Winter Soldier. Sebastian Stan doesn't get to say much in playing this role, but his fighting moves, glares and presence is flawless. Not only is Winter Soldier the first of the Marvel sequels to deserve a third, you literally want another, just to see where Sebastian takes his 'Bucky' next. Stan's dark and twisted anti-hero is counterbalanced not only by Cap and Co, but plenty of decent laughs. From the one-liners of Steve Rogers to a vision of Nick Fury's 'tombstone' reading The path of the righteous man. Ezekiel 25:17 in a nod to Jackson's infamous verse from Pulp Fiction, there are plenty to go round. And yes there is a post credit sequence. Unlike that of Thor 2, here it's actually worth sticking around for - boy is it ever. Lets just say, if you're a fan of the Avengers West Coast like I am, it will justify any ticket price. Captain America is my favourite Marvel hero and I firmly believe, done right, he moves from being Marvel's second most important character, to level pegged with Spider-Man. Admittedly, I was nervous about a film taking on Ed's iconic arc, but it justifies itself by believing in the tale it has to tell and focusing on the issues Ed did with artist Steve Epting, not the entire tale. It doesn't do these issues verbatim or even try. It tells its own story, one that is extremely non-comic book fan enjoyable, and one that truly sets the standards for what is to come. Avengers 2 included. I totally agree with you. I was a brilliant film. Everything just MOVED right. Cheers Kal - glad you agreed. Been a bit sick on this side of the fence, so was in a bit of a fump, but even that mood stood no chance against Falcon and Cap!